The eighteenth century then, was the golden age of the China Trade. During the nineteenth century it gradually tailed off. In 1805 we still have John Jacob Astor ordering porcelain from Canton. A service was also made in 1868 for the new American president Ulysses S. Grant. Today, over 3000 heraldic porcelain services are recorded as in at least part existence, and more are being discovered every year. They are highly decorative and have become much sought after, and internationally collected, both for their heraldic interest, and as investments. Two magisterial volumes by the late David Sanctuary Howard entitled “Chinese Armorial Porcelain” Vol. I, and Vol. II., illustrate and comprehensively list most of the known services. These encyclopaedic books are essential reference works for anyone interested in Chinese heraldic porcelain. Their listings and analysis of styles is exhaustive. The second volume, filled with coloured illustrations, is still in print (see below). But what of porcelain manufacture outside China? The secret blend of Kaolin and minerals (a variety of feldspar was essential) was sought in Europe for many years. Much experimentation was done in Italy, France and Spain. By the end of the sixteenth century a creamy porcelain was being made at Rouen, and afterwards at St. Cloud. This however, is the second type of porcelain known as “Soft Paste”. In 1710 an alchemist called Johann Bottger working for Augustus, King of Saxony produced a realistic copy of hard paste porcelain. From the 1720’s onwards the Meissen factory was producing a pure white porcelain, often decorated in imitative Chinese styles. This secret was protected for some time, but eventually leaked out to factories in Vienna, Berlin, and France. Trade restrictions meant that whilst large quantities of Chinese porcelain came into England in the early and middle of the eighteenth century, no German porcelain was allowed. Chinese porcelain remained the major influence on the English pottery industry, with local delftware and stoneware fighting to compete. There will always be discussions about who produced the first successful porcelain in England. This brings us to an interesting insight into a custom that persists today. Before the stronger types of porcelain were available, the material used would not stand boiling water and would often shatter. It was then necessary to put milk into the teacup first, and to “warm the teapot” which many people still do, without understanding the origin of the tradition. Finally, a Frenchman, Thomas Briand unveiled the secret of porcelain making in an address to the Royal Society in 1743. He entered into partnership with Nicholas Spirmont, a Huguenot silversmith living in London, and Chelsea Porcelain was born, closely followed by production at Bow and Derby. This mostly followed oriental and continental designs. The eighteenth century saw the rise and fall of many factories using both hard and soft paste porcelain. By 1751, the recently established Worcester factory was producing fine soft paste porcelain, much of it decorated with Chinese designs in blue underglaze. This particular porcelain was able to withstand boiling water, and soon became pre-eminent in producing tea, coffee, and chocolate ware in a wide variety of patterns and colours. 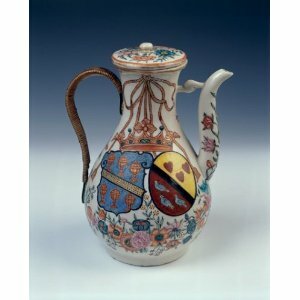 Displayed in the Worcester porcelain museum there is a small armorial collection of pieces made in the early “Dr. Wall” period of Worcester. This dates from 1770, and includes a coffee cup, tea bowl (as yet without handles) and a saucer made for Warwick Calmady Esq. of Cornwall. The arms were painted in London and show a blue and gold heraldic charge with a leaf and berry border, and a gilt dentil edge. Royal patronage was soon forthcoming and in 1789 (during the “Flight and Barr” period of Worcester) the newly created Duke of Clarence ordered a magnificent service, finely painted with coloured enamels, with his Arms and Garter insignia in the centre of the plates flanked by oak leaves, acorns and laurel. The border, with entwined ribbons containing the Badges of the orders of the Garter and the Thistle, pink roses and thistles. When Lord Nelson visited the Worcester factory in 1802, he ordered an extravagant service in the rich Imari (or “Japan”) colours of dark blue, red and gold. This was the most elaborate form of decoration available at the time, and produced by many English factories during the Regency period. Nelson ordered a dinner, breakfast, tea, and dessert service displaying his full coat of arms and his newly awarded honours. This service was dispersed by Lady Hamilton (who received a bill from the factory shortly after Nelson’s death). Pieces still occasionally appear in salerooms round the world. The Worcester Porcelain Museum holds a teapot and several other pieces from this service. There was also a large heraldic service produced for the Coronation of William IV. During it’s long history the Hon. East India Company commissioned many armorial services both from China and the English factories. In 1817 the Company at Fort St. George in Madras commissioned the largest armorial service ever produced at the Worcester factory. This contained over seven thousand items at a total cost of £4,190, 4 shillings. The service had a gold and salmon border with the full achievement of the Company in the centre. The arms are: Argent a cross gules, in the dexter chief quarter an escutcheon charged with the arms of England quartering Scotland and Ireland, The Crest is: A lion rampant or, supporting between the forefeet a regal crown, with supporters: Two lions rampant gardant or, each supporting a banner erect argent with cross gules. Of the other English factories, Bristol produced good examples of armorial porcelain, a noteworthy set being the Burke Service, made by Champion, on Burke’s election for Bristol in 1774. Davenport and Rockingham china were often armorial. Wedgewood and other Staffordshire potters often used heraldic emblems for decoration. Amongst the painters’ work books in the College of Arms, are accounts for arms and crests supplied to Wedgewood. Liverpool workshops specialised in Masonic arms and emblems for their wares, from about 1760 to 1770. 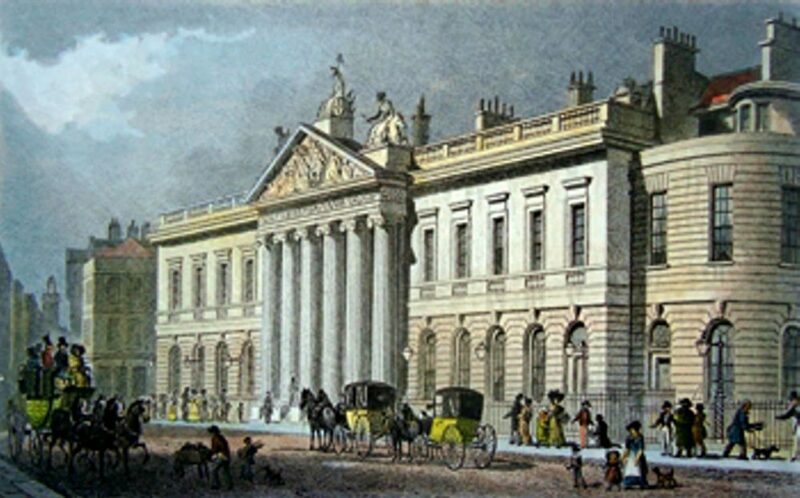 The City Livery Companies of London commissioned many fine services in the eighteenth and nineteenth centuries, many of which are displayed and occasionally used today. In 1800, Josiah Spode developed a bone china paste that became the standard English paste. As well as superb heraldic enamelling, the Spode factory was noted for its exotic birds. In the nineteenth and late eighteenth century the English factories produced additions and replacements to armorial porcelain which had been ordered from China by previous generations. A collector starting out in the field of armorial porcelain should be aware of the Parisian company of Sampson. This workshop was established about 1850 and made large quantities of decorated hard paste porcelain, copying Chinese ware, Meissen, and Sevres. Some of these imitations found their way into stately homes and other collections, where they are still being discovered, much to the chagrin of the owners. Illustrations of these copies can be found in David Sanctuary Howard’s Chinese Armorial Porcelain, Vol. II. But what of armorial porcelain in the twenty first century? It is still possible to commission porcelain with heraldic enamelling. The great companies of Staffordshire mostly belong to a New York investment fund. Much decoration is done on white blanks produced in the Far East. A few companies still offer a hand painted product using time-honoured methods, but the cost is high. When larger quantities are needed, transfer printing is often the best solution. Some companies offer porcelain decorated in Hong Kong and shipped to order. 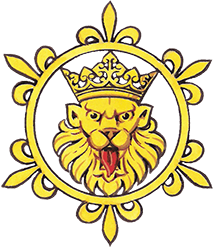 The Heraldic Porcelain Company of London works with a factory in Portugal which specialises in making superb porcelain reproductions from the Royal Palaces of Spain and Portugal. They buy the Kaolin in Limoges and ship it to Portugal for production. 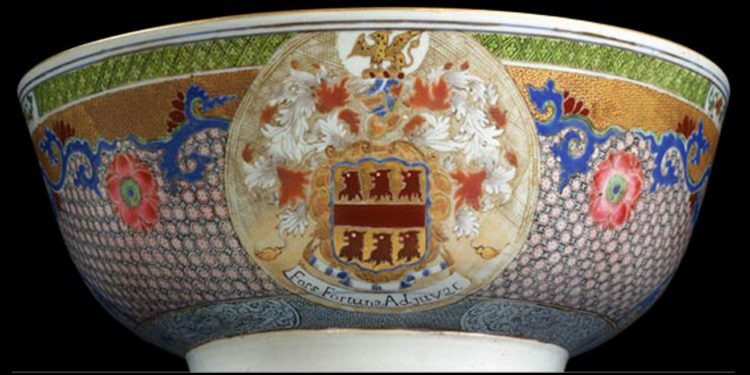 Armorial porcelain for private and corporate customers is regularly produced to a high standard. For collectors of earlier armorial porcelain there are specialist sales in the auction houses. Mrs. Angela Howard has a large selection at Heirloom and Howard, and fortunately carries on the scholarly traditions of her late husband David, collecting, lecturing, and passing on her knowledge and experience to a new generation of collectors. This subject has a huge fascination to those who are interested in Heraldry and the development of the China Trade. The history of heraldic porcelain, rather like hall-marked and crested silver, is there to be researched and discovered in so many beautiful objects. An added bonus for collectors is that heraldic porcelain has proved to be not only a delight to the eye, but a sound investment over the decades. Aubrey J. Toppin MVO, FSA, Heraldic China, Coat of Arms No, 3, July 1950. Regina Krahl & Jessica Harrison-Hall, Ancient Chinese Trade Ceramics from the British Museum London, (National Museum of History. Republic of China 1994).